The Houston Symphony will perform three 19th-century works during a concert on the Sam Houston State University campus on Friday (Feb. 6). Maestro Justin Brown, who has conducted around the world, will "guest star" with trumpeter Mark Hughes on Feb. 6 at SHSU. The performance, which also will feature guest conductor Justin Brown and trumpeter Mark Hughes, will begin at 7:30 p.m. in the Gaertner Performing Arts Center Concert Hall. “This is an amazing opportunity for the city and students of Huntsville to hear a major symphony orchestra, from the fourth largest city in the United States that includes world renowned musicians,” said Scott Plugge, chair of the SHSU School of Music. An internationally acclaimed musician in both the symphonic and operatic repertoire, Brown is general music director of the Badisches Staatstheater Karlsruhe, Germany, and music director laureate of the Alabama Symphony Orchestra. With the Badisches Staatstheater Karlsruhe, Brown has performed the first German production of the rare 20th century opera “Verlobung im Traum,” by Hans Krása, and Brown and the orchestra have been chosen to perform the annual benefit concert for the president of Germany in June 2015. 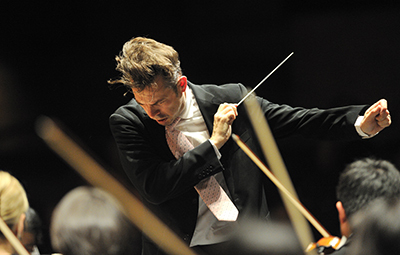 In six seasons as music director of the Alabama Symphony Orchestra, Brown and the group have received three first-place ASCAP and the John S. Edwards Award for Strongest Commitment to New American Music in 2011. His legacy includes the institution of a composer-in-residence program as well as the founding of the Alabama Symphony Youth Orchestra, and serving as guest conductor for many of the world’s top orchestras—including in England, Norway, Finland, St. Petersburg, the Netherlands, Malaysia, São Paulo, Sydney, Tokyo, and symphonies across the U.S.
Hughes "knows how to spin out a long line with the eloquence of a gifted singer," according to Derrick Henry, of the Atlanta Journal and Constitution. Hughes studied at Northwestern University with the late Vincent Cichowicz, of the Chicago Symphony, and following graduation, he participated as a scholarship student in the Civic Orchestra of Chicago. Since his arrival in Houston, Hughes has performed and recorded with the Boston and Chicago symphonies and continues to be in demand as a soloist, with orchestras and in recital. In addition, each summer, he serves on the faculties of the Brevard Music Center and the Texas Music Festival. Hughes lives in Bellaire with his wife, Marilyn, and their two children, Thomas and Caroline. Tickets are on sale for $30-35 and can be purchased by phone at 936.294.2339 or online at shsu.edu/boxoffice.